Worried about defending yourself? Or getting lost in the mountains? Well, an everyday carry OTF knife could be the answer to your problems. Out the front knife is a special pocket knife that deploys out of the front of the handle and can retract back into it as well. These are perfect for knife lovers and will certainly make for a very good addition to their collection. Looking for the best defense out in the streets? Well, the Smith and Wesson Assist will never fail you. The knife is equipped with a black spear point blade that is 3.25 inches in length. The black finish ensures the blade is resistant to scratches and corrosion. The OTF Assist Actuator allows easy and quick deployment of the blade at the push of a single button. This means you can whip it out and use it without fumbling around to open it. However, you need to reset the mechanism when retracting it as this is a single action blade. Furthermore, the locking mechanism of the blade is strong to prevent any accidental opening. Another feature worth mentioning is the ergonomic aluminum handle which ensures a safe and secure grip. Also included is a Stainless Steel pocket clip for ease of carrying. We’d recommend this knife to anyone looking for a reliable and safe option under a budget. Another veteran in the industry, the Schrade Viper OTF Knife is a fan favorite. Its high-quality blade is especially cryogenically treated. This grants it toughness, wear resistance, and prevents chipping. The blade profile is straight and 3.5 inches long which increases the versatility of its application. The best part is the lightning-fast deployment of the blade, which makes it easier for you to mount a better defense. The Aluminum window breaker handle is textured to ensure a strong grip on the knife. The knife is equipped with a pocket clip, which you can position in 4 ways: tip-up, tip-down, left handed or right handed. This makes the knife ambidextrous and easier to use. The knife is perfect for everyday carry as it has a thin profile and its carry can be customized in a number of ways. So, whether you’re camping, hiking or simply keeping it around as an EDC, this knife will be your perfect match! The Zulu Spear is an Out the Front Knife which is perfect for users who prefer a more minimalistic design. The Knife is quite sleek and compact with a textured gray aluminum handle that ensures the perfect grip. The aircraft grade aluminum handle is quite ergonomic and ensures the knife stays secure in your hand. It also makes the knife lightweight and easy to carry around in a pocket. The knife weighs about 2 ounces. The blade is a dagger style blade and is about 2.875 inches long. The blade has a satin finish and is double-edged. This means you can use the edges for cutting and the point for the defense. The knife is equipped with a powerful heavy duty double action deployment. All you need to do is slide the lock with your thumb and the knife is at your service! And it is just as easy to retract. Furthermore, the pocket clip can be used to carry tip-up or tip-down. All in all, it is perfect for survival as well as defense situations. Perhaps one of the most well-known knives is the Benchmade Infidel Dagger. The dagger boasts of a dual action deployment system which makes it easy to retract as well as deploy. It can be used one-handedly as you do not have to fumble with the lock each time you want to retract your blade. The switch is mounted on the spine and is quite easy to operate. The aluminum grip handle has a series of steps that fit perfectly to the shape of your hand. The blade itself is about 3.95 inches in length and has a satin finish. It is doubled edged which makes using it much easier. The Infidel Dagger comes with a deep pocket clip which makes it very secure and ensures it doesn’t fall off your person. Overall, the design for the dagger is quite robust and sturdy. The knife is very easy to use and is perfect for beginners who have just started on an EDC knife. The Guardian Tactical can act as your true guardian angel out in the dangerous streets. The Recon model is an exceptionally cool looking knife that is practical as it is beautiful. The blade is finished with a two-tone black satin. The blade is a drop-point style and has a decent length of about 3.375 inches. The handle is an anodized black one that is compact and lightweight. The handle is durable as well and gives the knife its sturdy build. The OTF mechanism used in this knife is a dual action automatic one which means you can easily retract and deploy your blade. The fast and smooth opening ensures a more quick response to any threat from your side. The locking system is present at the side of the blade which makes it easier to open and close the knife. 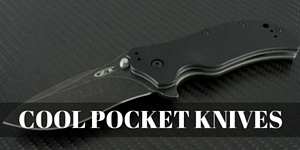 The knife includes a pocket clip as well, however, the pocket clip is fixed and can only be used for tip-down carry. All in all, the Guardian Tactical Automatic Knife is a high-end beautiful knife, well worth the price point. Know that we know a few of the best otf knives available today, let's take a look at what makes them great. Here are a few features to look for in an OTF knife. Single Action OTF knives are equipped with a powerful spring system that propels the blade out in a second when the button is pressed. However, to retract the blade, the user must manually reload the spring user a handle and then retract it himself. Operating these knives are harder and use both hands. However, these knives are cheaper than their double action counterparts. The Double Action knives, often called D/A, are loaded with a spring mechanism that not only deploys the knife but retracts it automatically as well. These are faster and smoother to use and are perfect for situations where you need speed on your side. They can be used with one hand. However, these knives are generally more expensive and more complex. With the additional moving parts, they are more susceptible to problems. How to choose the Best OTF Knife? With so many different options in the market, how do you choose the best OTF knife? Of course, there are a large number of factors that help you decide whether the knife is suitable for you or not. To help you make an informed decision, we have compiled a buying guide to help you below. The first thing you need to decide is how you are going to be using the knife. Do you want to use it for survival tactics when you’re out hiking in the woods, or do you prefer to use it for hunting? You might want to carry it out in the streets for defense purposes. Why does this matter? Well, if you’re hiking or hunting, then a cheap single action knife will do as speed is not your number one priority. Also, you might need one with a blade shape that suits cutting. On the other hand, if you’re using it for defense purposes, a spear point knife that is double action will suit you better as they are faster to deploy and can be used for stabbing. Drop Point: Used more frequently for hunting. The tip of this blade makes a convex arc which makes for a thicker tip making it easier to cut. Tanto: Tanto knives have a more angular shape and are double-edged. However, it is also ideal for hunting and not defense. Spear Point: This knife is more shaped like a dagger and has a double edge. These are more suited for defense purposes. Clip Point: There is a concave or straight cut out at the tip of the blade. It is an all-around blade. Straight: Straight edges are better for hunting as they cut clean. They sharpen easily and quickly as well. Fully Serrated: Very rarely found in OTF designs, fully serrated knives are better at cutting through fibrous materials such as ropes. They stay sharp for longer, however, once dull, they are hard to sharpen. Partially Serrated: A common design found in OTF knives, the partially serrated knives serve as a medium between straight and serrated edges, providing advantages of both. One of the biggest concerns for any knife owner is the size of the blade. You should find out what size you are comfortable with carrying. Of course the larger the size the better it will be at cutting. So, we recommend going for an average blade size of about 3 inches. Larger blades are more suitable for outdoor uses while for everyday carry go for the smaller ones. Next, you need to ensure the knife you pick has a strong locking mechanism that keeps the knife closed or keep it open. Most OTF knives have a locking liner, which is sufficient to provide safety. Most blades are made from stainless steel which is strong and durable. However, stainless steel comes in a variety of different grades. Ensure you choose the highest quality steel blade available within your budget. We recommend choosing one with more chromium or one that is black anodized as the last much longer. You need to ensure that the handle is ergonomic as well as grippy. It should fit snugly in your hand to prevent accidental slips. Pick ones with grooves in their sides as they are easier to hold and there are very low chances of anyone snatching it from you. We recommend going with aluminum handles as they are compact and lightweight. All in all, OTF knives are best for everyday carry and can help you out in any sort of sticky situation. However, if we had to choose one, we would choose the D Rocket Designs Zulu Spear time and again. The Double Action mechanism makes for a smoother and faster response which could mean everything in a life or death situation. The aluminum handle and the stainless steel blade are perfect for every day carry. The sleek and compact knife might have a short blade, however, it still never fails to deliver when it comes to cutting action. As a bonus, edge retention is off the charts!